During jury selection for the murder trial of Chicago officer Jason Van Dyke, emotions were high for attorneys and activists. Van Dyke is currently suspended from the force pending the outcome of the case. He is charged with first-degree murder, 16 counts of aggravated battery, and official misconduct for the killing of 17-year-old Laquan McDonald on October 20, 2014. 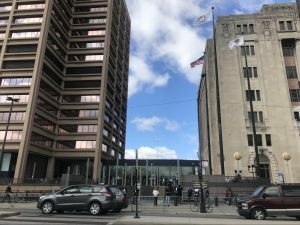 Van Dyke’s case is being heard by Judge Vincent Gaughan at the Cook County Criminal Courthouse on 26th Street and California Avenue, where Gaughan and attorneys last week finished selecting jurors to decide the case. In another contentious moment, Van Dyke’s lawyers made a motion to strike one juror for cause. The defense attorneys felt that the potential juror, a white man who worked in finance and supported the American Civil Liberties Union, would not be able to rule fairly because he said on his questionnaire that police officers seem to use excessive force on non-white civilians. Gaughan spent several minutes discussing physics with the potential juror, who has a degree in the science. The judge observed that the juror recognized that his knowledge as a citizen was separate from his knowledge as a juror. Gaughan added that the juror was likely analytical and could judge based on facts due to his background in numbers. For these reasons, Gaughan struck the motion, prompting Van Dyke’s attorneys to excuse the juror through a peremptory strike. In jury selection, each side is granted a limited number of peremptory strikes that allow them to strike potential jurors for cause. Yet, when Van Dyke’s attorneys continuously struck non-white jurors, it raised questions about a biased jury, as many saw it. Although census data shows that Cook County is 43 percent white and 23.9 percent Black, the racial makeup of the Van Dyke jury is seven white people, one Black person, three Latinx people, and one Asian person. Expressed in percentages, the jury is 58.3 percent white, 25 percent Hispanic, and 8.3 percent Asian and Black, respectively; the only two ethnic groups that reflect the makeup of the county are Hispanics (24.5 percent of Cook County) and Asians (6.8 percent of Cook County). 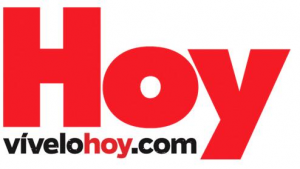 Nonetheless, Van Dyke’s attorneys opted for a jury trial on Friday, Sept. 14. Defense attorneys do not think Van Dyke will get a fair trial in Cook County, so they requested a change of venue, but on Monday, Sept. 16 Gaughan denied that motion. “We come to you with a righteous justice…we must still fight for the truth,” said Saeed Richardson, addressing his pleas to God. Richardson is director of policy at the Community Renewal Society (CRS), and one of several members at the vigil from the non-denominational group. Robert L. Hall, another representative from CRS, talked about a possible acquittal, citing acquittals in other high-profile cases, such as George Zimmerman after he killed 17-year-old Trayvon Martin. “We pray that [an acquittal] will not happen,” he said. Hall described the work that Calloway has done to improve Chicago’s Black community. 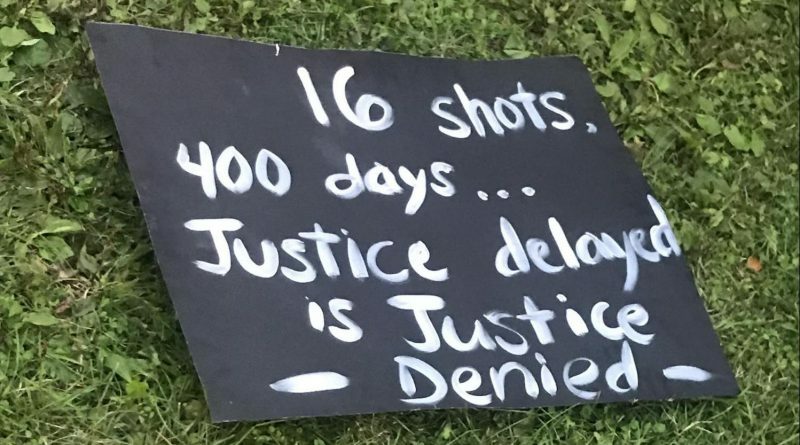 Calloway, who worked with independent journalist Brandon Smith to force the Chicago Police Department and Mayor Rahm Emanuel’s office to release the dashcam footage of the shooting, has four pillars he focuses on in his activism, according to Hall. 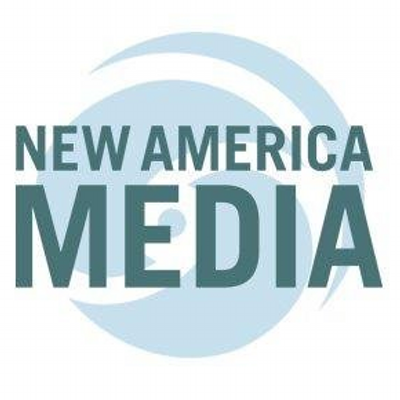 They are: “rapid mobilization, sustainable peaceful demonstration, social and policy changes, and narrative and media content,” as Hall described it. Hall also called on African American journalists to cover stories of police accountability and make sure that Laquan is not demonized. “You have a huge role,” he said. 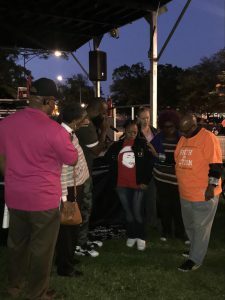 Vigil attendees also talked about the prominence of police brutality in minority communities, mentioning police brutality victims like Sandra Bland, Tamir Rice, and Rekia Boyd, who was also killed by a Chicago police officer. Attendees then cited historic Black leaders like Fannie Lou Hamer, Sojourner Truth, Harriet Tubman, Emmett Till, Stokely Carmichael, Malcolm X (who changed his name to El-Hajj Malik El-Shabazz), and Fred Hampton, a founder of the Black Panther Party who was also killed by the Chicago police. 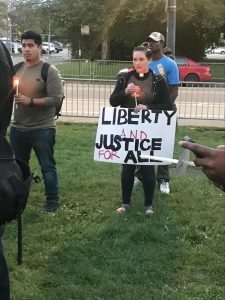 According to Reverend Lindsey Joyce, a Methodist Pastor from the Irving Park neighborhood, police officers must “come to terms with the violence of the system they’ve chosen to protect.” Joyce was not the only one who expressed anger toward a seeming lack of accountability. While there was anger, there was no violence; several police officers stood nearby during the vigil, and none of the attendees approached them, dispelling the characterization that protesters were violent. Melanie L. Brown, CEO of Melanie Brown Media, talked about how stereotypes are harmful, since they might have influenced Van Dyke’s perception of McDonald.